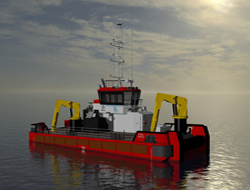 Shipbuilder Neptune Marine has been contracted to construct a new workboat for Scotland’s Stewart Marine, a provider of global offshore renewable energy support services. Set to be named Viking Energy, the vessel will be built to the specifications of Neptune Marine’s EuroCarrier 2611 class, with intended tasks including cable-laying, subsea cable protection and offshore wind farm support. The vessel will also feature the notation dynamic positioning 1 (DP1), in recognition of its seakeeping abilities. A staple of Neptune Marine’s output over the past 20 years, the EuroCarrier 2611 concept features a length of 26.48m, a breadth of 11m and a gross tonnage of 255tonnes, and has been designed to draw 2.93m. Typically, this vessel type is powered by a pair of Caterpillar C32 ACERT engines, generating a combined output of 1,940kW at 1,800rpm and driving 1,850mm-diameter nozzled propellers. This arrangement grants the class a typical speed of 10.8knots and a bollard pull of approximately 35tonnes. This model has also been designed to store up to 107,000litres of fuel oil and 67,000litres of fresh water, and to offer air-conditioned accommodation for up to seven persons. Neptune Marine has now commenced building of Viking Energy at its facility in Aalst, the Netherlands, and expects to hand the workboat over to Stewart Marine in April 2019.